This is where I'd be Thursday night if I was on that other coast. It's actually a weekly reggae thing. I got to check out a similar event on my New York trip a while back. I have to say it was really fun. And I don't even like going to clubs. I don't dance. I've never been a dedicated reggae fan. It's a wonder I have any friends at all. But I loved the music and the mix of people. I would go again for sure. Especially this Thursday. 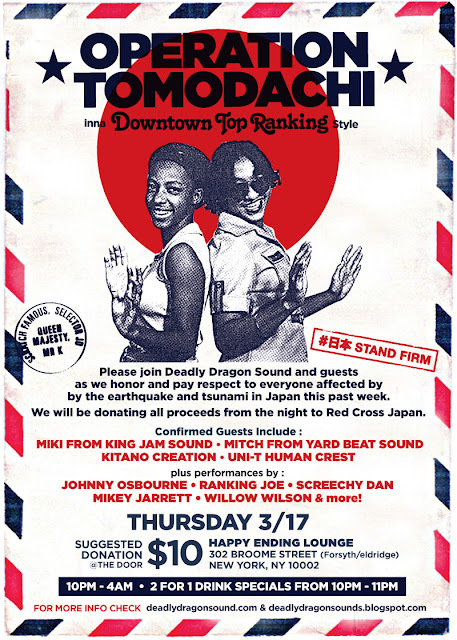 It's a special fundraiser for Japan Red Cross. My long time friend BT has somehow put this together in one week. The kid has high standards, so I know it will be good. And I think we can all agree that it's important to do something for the cause. Not only are there people who could use our help, doing something about it is like taking an antidote to news-induced stress disorder. I mean, there are humanitarian crises throughout the world, but the unimaginable severity of the earthquake and tsunami in Japan makes this one especially urgent. Please share with anyone who might be interested, especially if s/he lives in the New York metropolitan area. And if you have an event or project to share for Japan tsunami and earthquake relief, please do.